With a degree in general business, students are not limited to a singular area of expertise. Graduates can expect careers in the banking and financial sectors, consultancy, human resources and marketing roles. It can also give you the skills to create your own business, or to take on business and management roles within more creative industries. Employment opportunities are limited only by your knowledge, experience, and ambition. In today's globalized world, where competition among businesses is at an all-time high, there are very few careers in which a comprehensive knowledge of business isn't admired. The best graduates can expect to be placed in various challenging roles to make use of their skills at being equally talented at managing numbers as they are at managing people - they're leaders, strategic thinkers, creative problem solvers, and innovators. Furthermore, this degree also prepares candidates to apply for a master’s program further in their career after gaining much-needed work experience. NUCB is one of 817 business schools in 53 countries and territories that have earned AACSB Accreditation. There are only three other schools in Japan that also have AACSB. AACSB-accredited schools have better programs, better faculty, better students with higher overall GPAs, more international students, more employers that recruit from them, and graduates that receive better salaries. NUCB is renowned as a pioneer of implementing active learning methods. This innovative participant led learning method is in contrast to the traditional one-way faculty-led mode of instruction and engages students in activities such as discussions, group work, and presentations. Studies have proven that when students engage in activities it promotes increased content knowledge and higher order thinking skills such as critical thinking and analysis as well as positive attitudes towards learning in comparison to traditional lecture-based delivery. In 2017, NUCB received 103 international exchange students from 32 countries around the world. 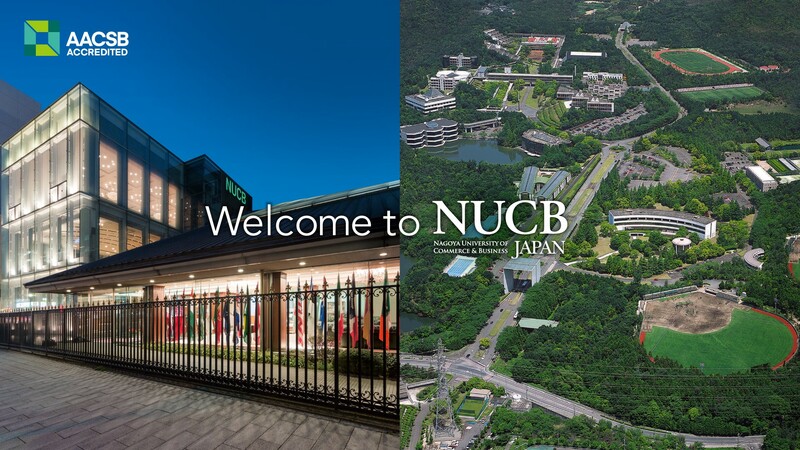 In 2018, NUCB ranked 1st in Central Japan in the Times Higher Education World University Rankings for "Internationality". This category ranks universities that have a supportive and inclusive university environment full of talent from across the world. Almost 80% of our faculty have obtained a doctorate degree from top institutions around the world including Harvard, MIT, and London Business School to name a few. In addition, we adhere to the strict standards set by the education boards of AACSB and AMBA in that our faculty must also possess significant work experience related to their field and make a continuous impact in the academic world.